The battle for Aleppo began in mid-2012. Fighting ended with the government taking control of the whole of the once divided Syrian city in December, 2016. 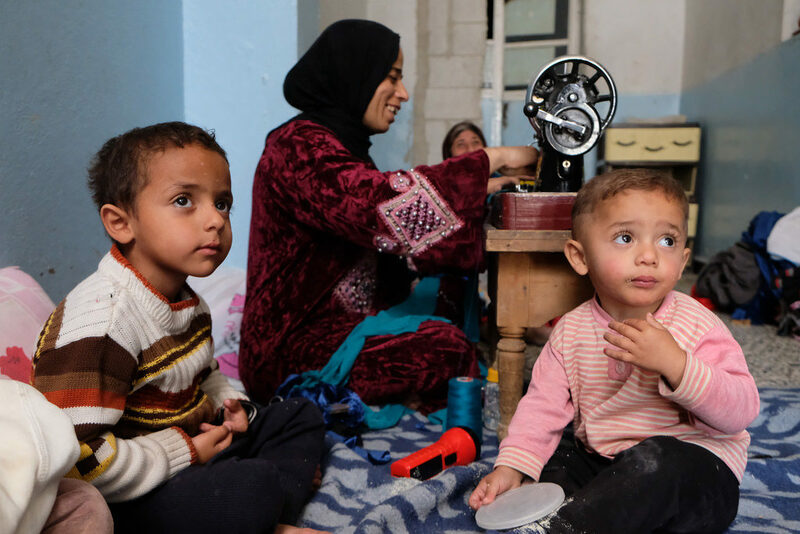 One year after the end of hostilities, families are rebuilding their lives. 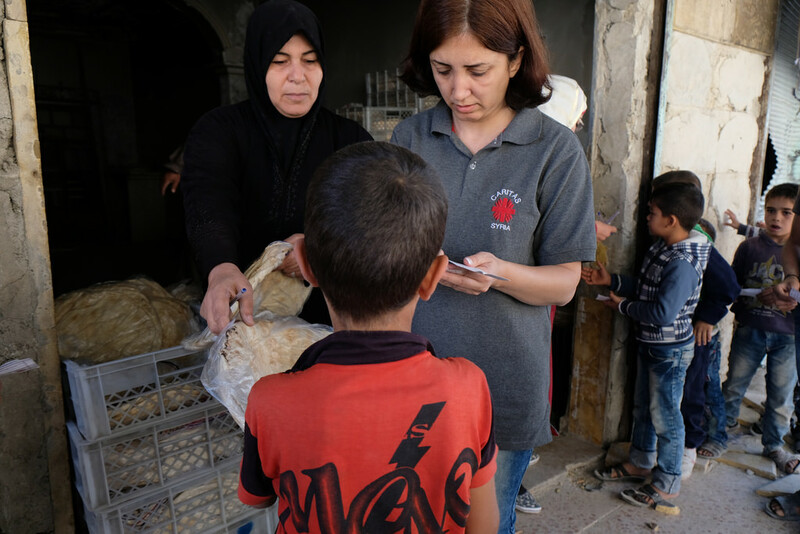 Caritas works in the east and west of Aleppo, reaching 35,000 people with aid distributions, counselling and education, medical and rent support. 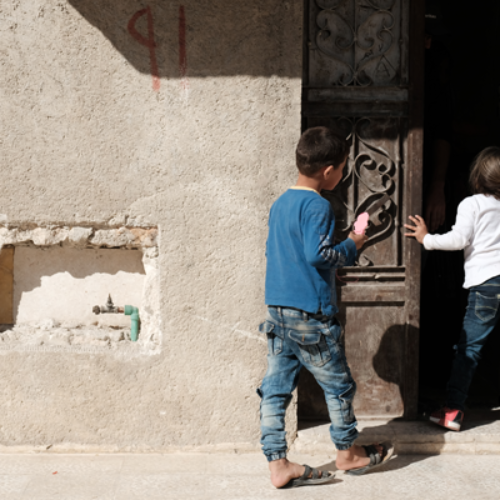 “War taught me to live in the moment,” said Maher Samaan, a thirty-something resident of Syria’s largest city. Maher stayed in Aleppo throughout the years of conflict. “Aleppo was full of violence. We saw a lot of blood. My niece was on a bus when fighters opened fire. Everyone was killed. We lost friends and family. We lost our future and our hopes,” he said. One of those friends was Amira Macharekji. “I was working in a dangerous area. I lost my job when rebels seized the building,” she said. Amira went to Lebanon in 2012. The two kept in touch by text message. “We were best friends. I knew his secrets and he knew mine,” said Amira. 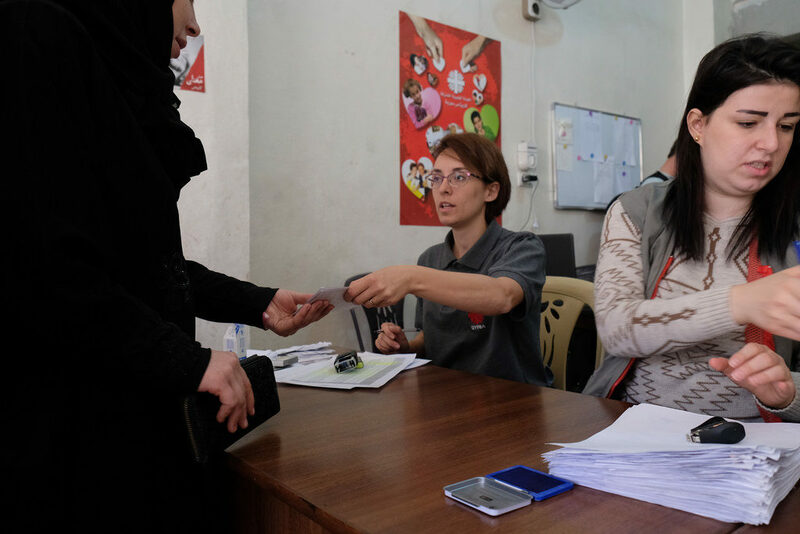 Amira Macharekji (centre) is an M&E officer for Caritas in Jabal Badro in Aleppo. The fighting in Aleppo ended 12 months ago. “When the conflict stopped, your thoughts turn to the future. It’s hard to see life again. You’re a survivor and you don’t have anything,” said Maher. Amira returned from Lebanon this year to plan the engagement, the wedding and a future together. “The wedding in September was awesome,” said Maher. “We made something special to represent our identity and personality.” Their wedding song was Metallica’s ‘For Whom the Bell Tolls’. Bride and groom both wore Converse sneakers. Many of their friends and family weren’t there however. Maher’s best friend is in Brazil, Amira’s brother is in Sweden. “That’s life. That’s the situation,” said Amira. “We have dreams of travelling abroad, seeing the world, living a free life,” said Maher. “Step by step,” said Amira. At the hospital, doctors said that Amal’s leg was badly damaged. “I promised to sell everything to pay for surgery to save it,” she said, but the leg had to be amputated. Amal (front) with her mother and siblings. Sama’s husband is a soldier, often away from home. She has brought up the children mostly alone. “Every time Amal moved, blood came out. Life was very difficult,” she said. 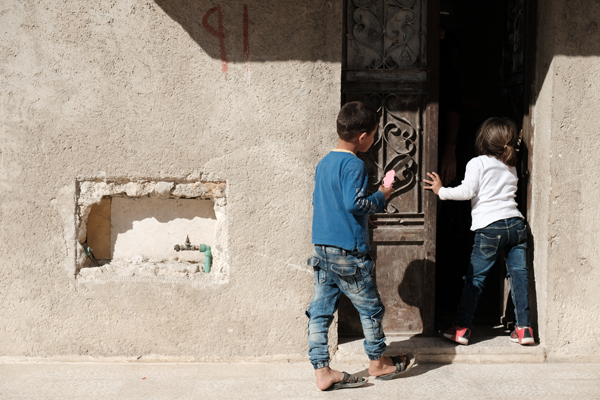 Caritas provides Sama’s family with food, clothes, water and hygiene items. “Life is difficult, especially the expenses,” said Sama. As many as 13,000 bombs fell on the 250,000 people of East Aleppo in 2016. On the ground, rebel militants in control of the area carried out murder and torture, withheld food and medicine and enforced a reign of terror. 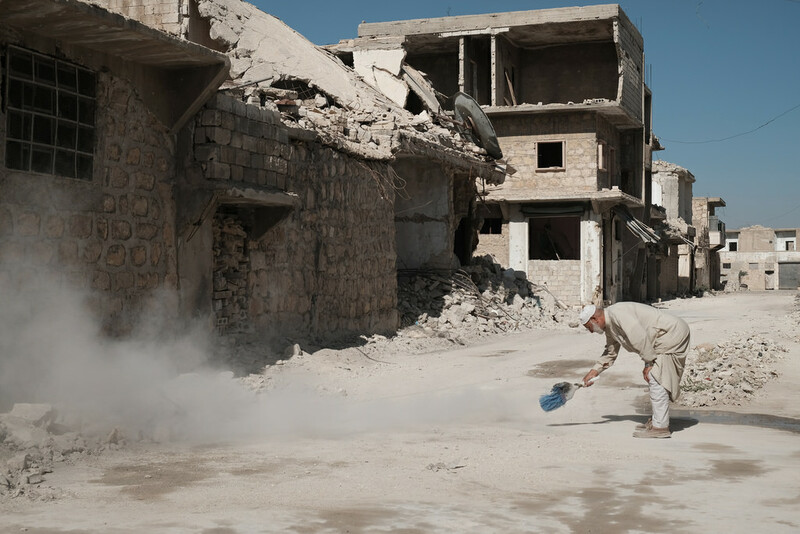 “We were living under bombardment from the skies and threats on the ground,” said Manara Aded Al Hamid, a mother of five who stayed in East Aleppo throughout the siege. Manara Aded Al Hamid with her children. Another daughter Hamida has a brain inflammation disease. “My daughter fell into a coma. 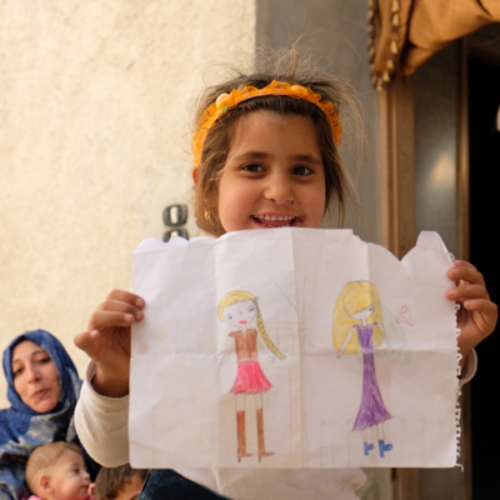 With no medical supplies, we had to give her expired medicine.” The end of the siege came just in time to get her to a hospital and receive the emergency care she needed. Streets in East Aleppo are being cleaned of debris, people are returning to their homes and shops are opening. Caritas has installed water tanks in the neighbourhood. “What has improved is the electricity supply. 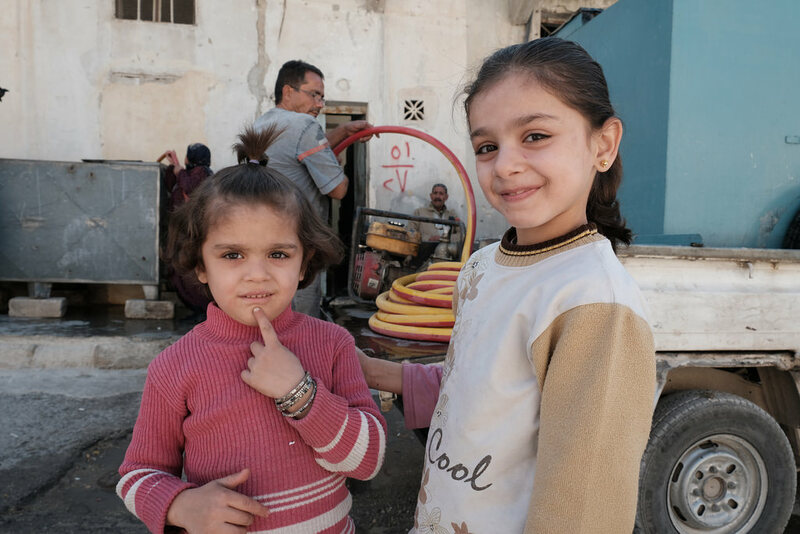 Plus, we have a pharmacy and most importantly, we have water,” said Manara. During the siege in East Aleppo, no school was open. 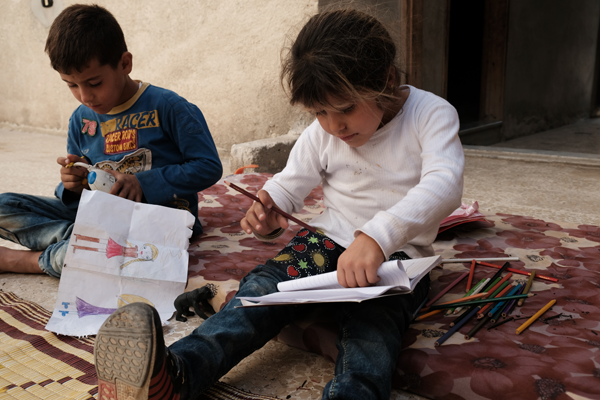 Manara and her friends provided lessons for about 20 children. They followed the national curriculum as best they could over four years. 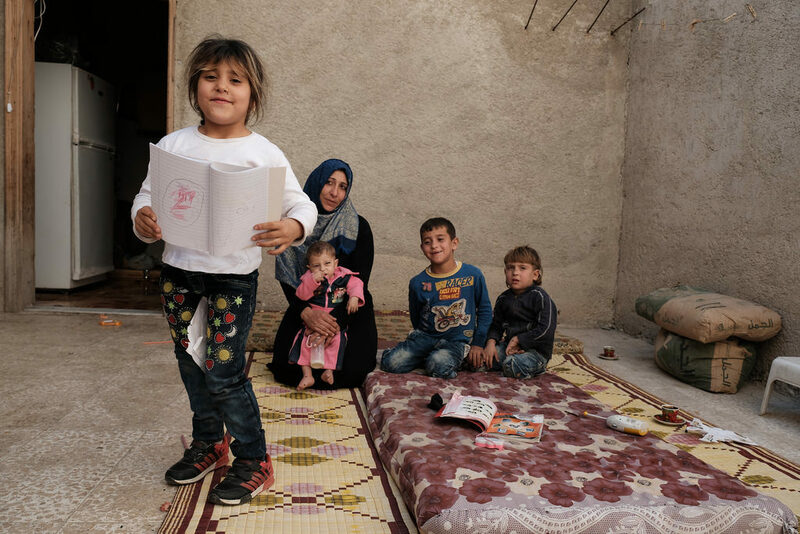 After the fighting finished, Manara sent her children to a school, about a 6km walk away. “When the schools examined the children, they found that they were at the right level for their age and put them into the appropriate class,” she said. 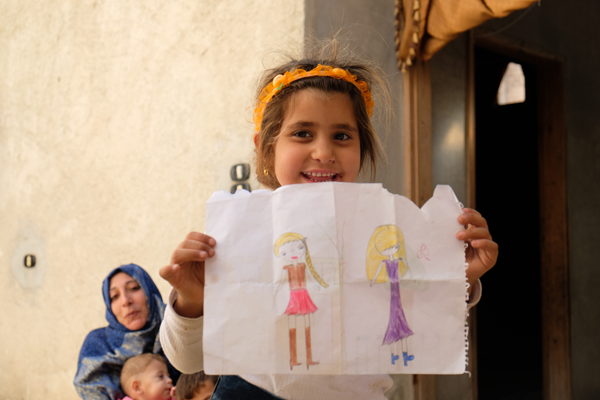 Jenna, Jhina and Hiba are now seven, with two older sisters, Sidra and Isra. The family was forced from their home by the fighting in Aleppo. They live in a small, expensive two room place with their mother, father and grandmother. 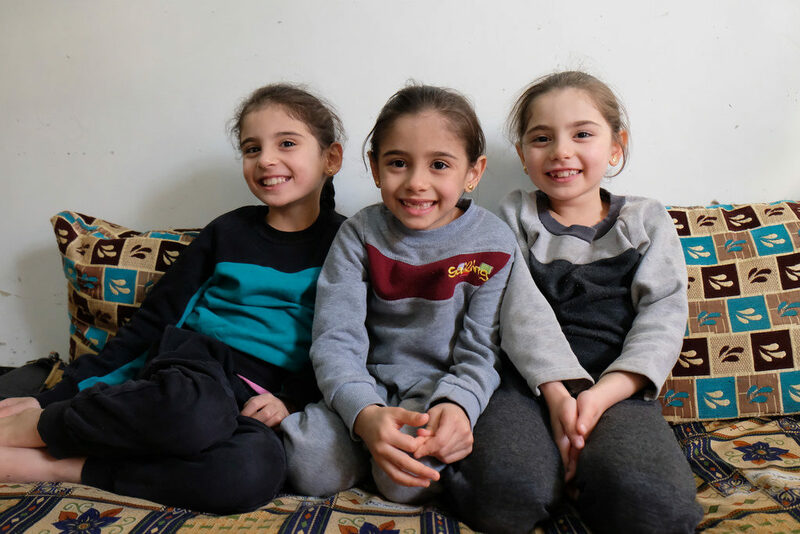 Triplets, Jenna, Jhina, Hiba are 7 years old, and they go to a Caritas centre in Aleppo where they receive education support. 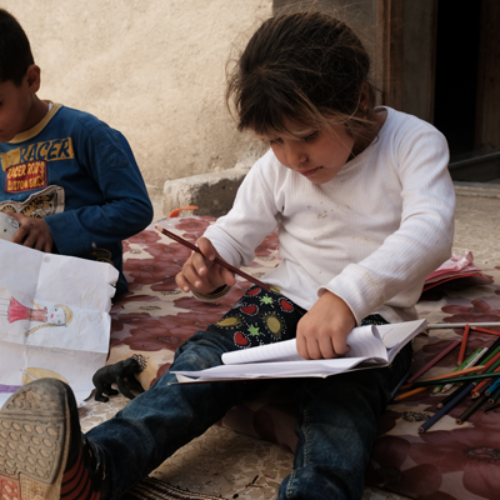 For most of the children of Aleppo who have lost years of study, the extra classes help bring them up to speed. Caritas also provides assistance to public and private schools and to university students. In schools, Caritas has provided school bags and stationary. For university students, Caritas gives cash to cover transportation and books. His is one of the schools Caritas helps. “The students received school bags full of notebooks and stationary from Caritas,” said Jamil. Before they carried their pens in plastic bags. 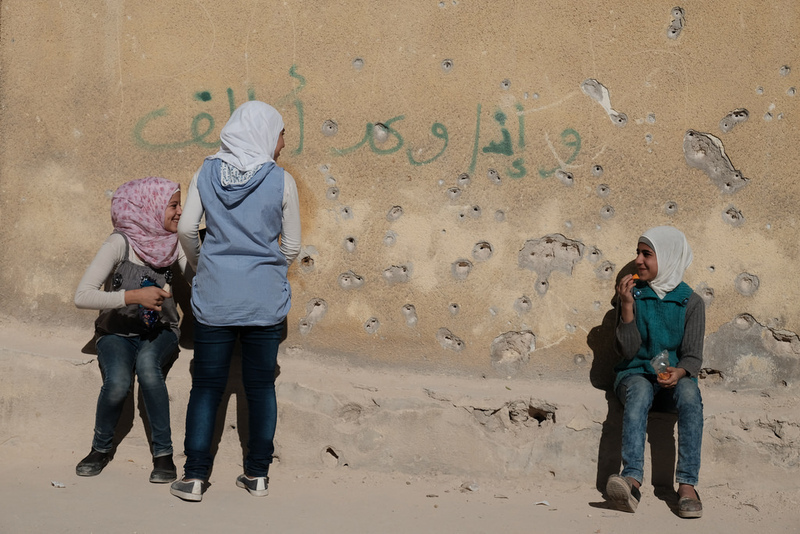 A school on former frontline of conflict in Aleppo. Caritas distribute school bags containing stationary and books. 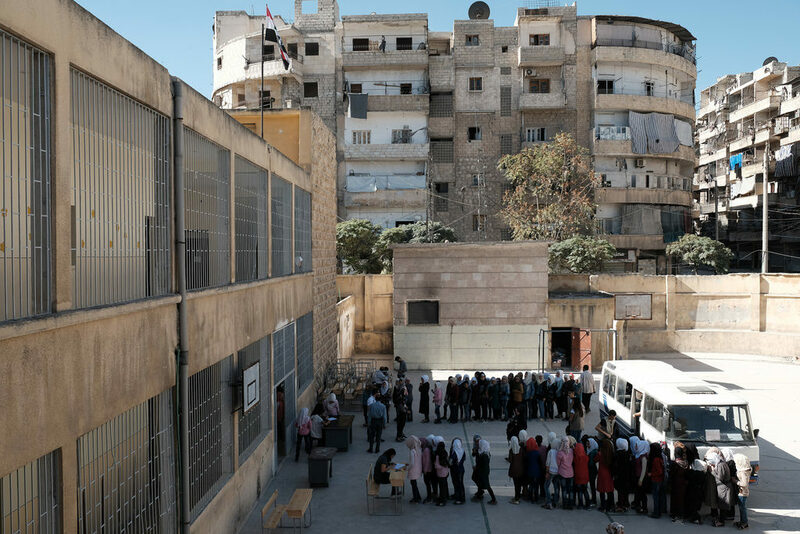 The majority of students had dropped out of school in this part of Aleppo and had started to work so their families could survive. “The help Caritas gives encourages the parents to send their children to school. They can become reluctant because of the expenses,” said Jamil. The biggest gap is a lack of teachers. “Before the crisis, the school had 50 teachers for 500 students. When we reopened there were seven teachers,” said the principal. “My home was like heaven. I loved to clean it and then sit outside to drink a coffee,” said Yvette Baladi, an 80-year-old widow. Her house was destroyed in the fighting six years ago. 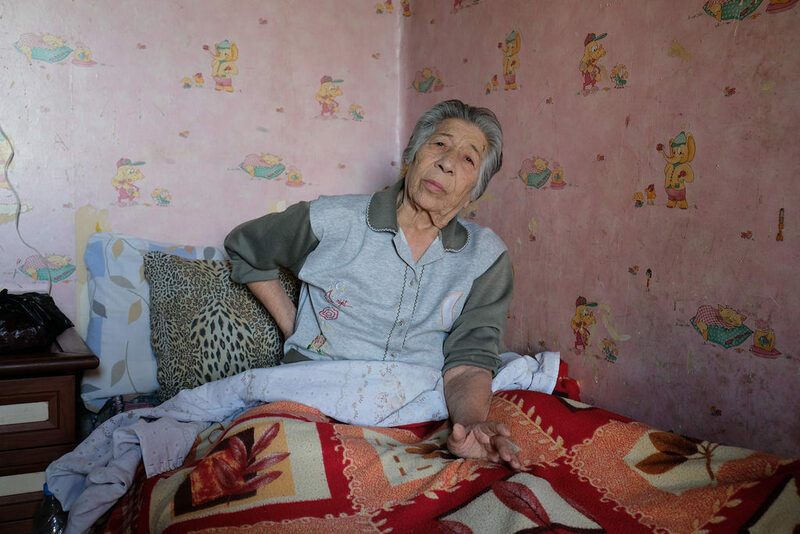 “They took everything, now it’s just stones and rubbish,” she said. Yvette is dependent on neighbours for everything. A doctor helps pay for the rent. Caritas provides food, blankets, medical support and its social workers visit regularly. Yvette broke her hip four years ago. “There was no electricity. I went to fetch a candle and fell,” she said. She can’t walk well enough to leave the room. She is dependent on neighbours for everything. A doctor helps pay for the rent. Caritas provides food, blankets, medical support and its social workers visit regularly. Caritas also hosts social gatherings, with meals and gifts for the elderly, as well as regular visits and medical help. Abd Al Hakkim fled East Aleppo when the fighting became too fierce. “People died and there was nobody to bury them. If you died on the streets, you were left to the dogs.” The battle for Aleppo was the worst thing he has ever seen.